History & Honeymoon: Part One | Paul's Voyage of Discovery & Etc. 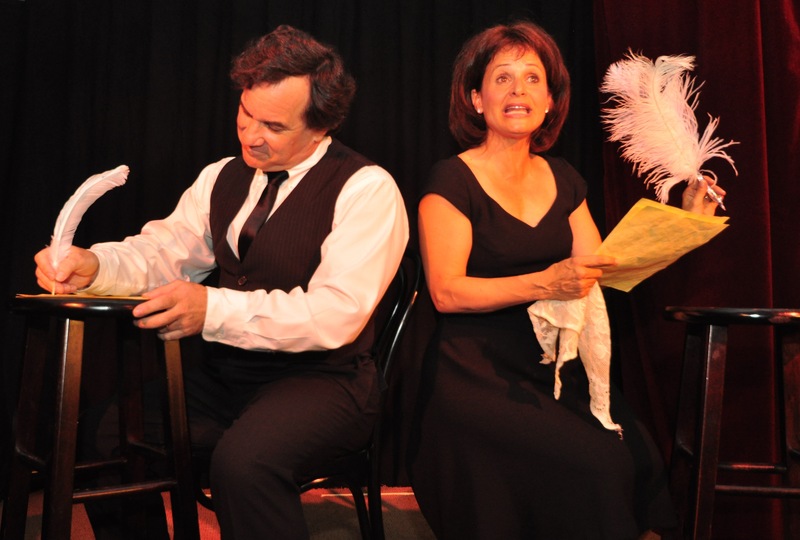 On Sunday June 27th, my wife Victoria and I gave our last performance of “The Vic & Paul Show” in it’s three-week run at PUSH Lounge in Woodland Hills. It was a satisfying end to a wonderful run — made all the more special by so many great friends, Northwestern pals, and people we dearly love but haven’t seen in ages who showed up to share the experience with us. It had been more than twenty years since we’d done a comedy show together – and exactly twenty years since we’d said “I do” in a Greek Orthodox service on a blistering hot day in Chicago. With our 20th wedding anniversary on June 30th, the show was essentially a celebration of our two decades of married bliss – and as we struck the stage at PUSH for the last time, our thoughts turned to our upcoming anniversary trip: a return to the great Civil War battlefield at Gettysburg. That I could even propose two such options to my bride-to-be was proof that I was already the luckiest man in the world – but when she chose the battlefield tour, I was certain that our union (just like the Union that Lincoln’s armies defended on that hallowed ground) would long endure. 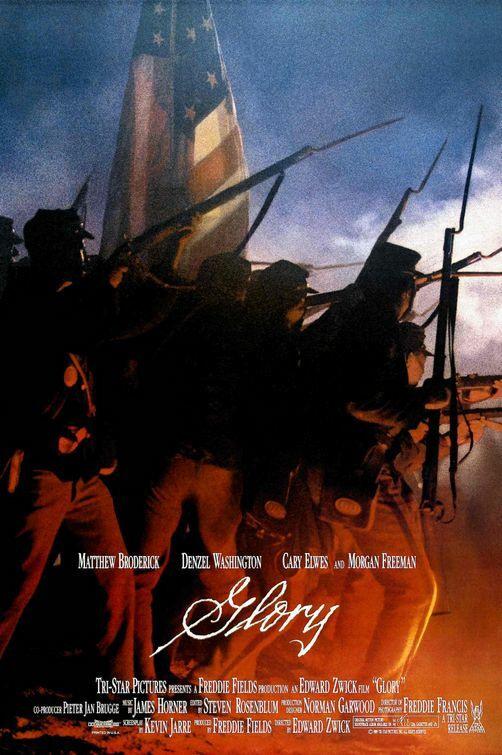 Our first stop in 1990 was Gettysburg, and while we did not plan it that way, we arrived on July 1st – the 127th anniversary of the first day of that epic 3-day battle. It was kismet. We were where we were meant to be. Thus, it felt right that on such a momentous marital (and martial) anniversary, we should go back to the small Pennsylvania crossroads town where Robert E. Lee’s 1863 invasion of the North came to a bold and bloody end. Romantic, yes? 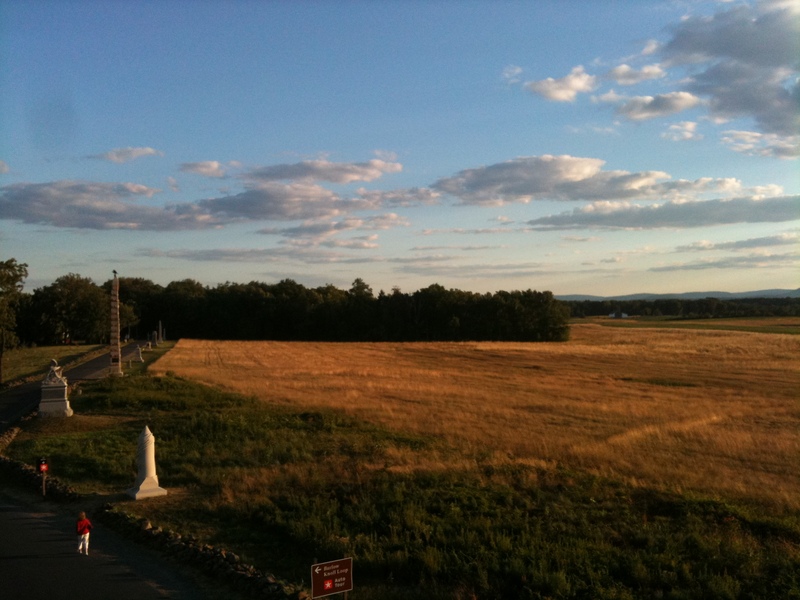 We flew into Philadelphia on June 30th, the eve of the battle, and drove west to Gettysburg. We wanted to make sure that we got to our Bed & Breakfast while these was still light on the battlefield. It was a 3-hour drive and we were hungry, so we stopped for a late lunch. But no service plaza grub would suit this history-loving couple – and with the help of her iPhone, Victoria located the perfect spot for a picturesque and historic nosh just a few miles off the turnpike. So, we turned off at the Morgantown exit, headed for the Inn at Saint Peters Village. Saint Peters Village was entered onto the National Register of Historic Places in 2003. It’s a small, late 19th century industrial “company village” on the banks of French Creek in Chester County, PA.
For about half a mile, vintage buildings line the main drag that winds up a steep, rocky ravine, with the creek running through giant boulders below. 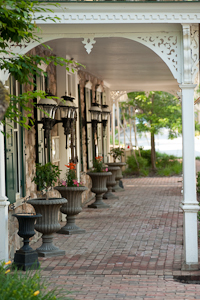 Artists and craftsmen have set up shop in the clapboard 19th century storefronts, and the biggest and most architecturally impressive of these is The Inn at Saint Peter’s Village, where we enjoyed lunch on a large wooden deck overlooking French Creek. It was beautiful. So far, so good. 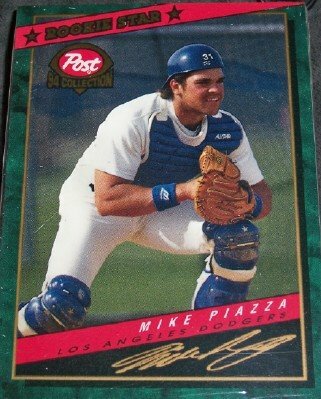 Interestingly, National League baseball managed to re-enter our honeymoon thoughts when our waitress casually mentioned that Mike Piazza’s dad “owned the whole town.” It turns out that arguably the greatest hitting catcher in Major League history (427 Home runs, career .308 batting average) grew up in nearby Phoenixville with his parents, Vince and Veronica. It was nice slice of local history to go with my pizza. 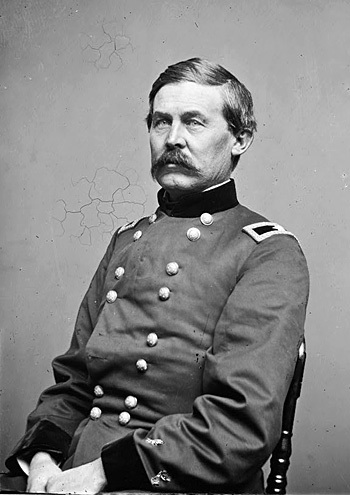 It was nearing 6:00 PM as we drove into Gettysburg down PA Route 30 and onto the old Chambersburg Pike – the same road that General John Buford rode into town with his division of Union cavalry late in the day on June 30th, 1863. That evening long ago, a grimly determined Buford watched with concern as a brigade of Confederate infantry under General Pettigrew probed south from Cashtown along the Chambersburg Pike toward Gettysburg. Pettigrew’s brigade had been sent by his division commander, General Henry Heth, of A.P. Hill’s Corps in search of much-needed supplies — including a cache of shoes they understood to be in the town. But when Pettigrew saw Buford’s cavalry arriving south of town, he returned to Cashtown and told Heth and Hill what he had seen. Despite Pettigrew’s claim that Federal cavalry was on the Chambersburg Pike, neither of his superiors believed there was anything more than Pennsylvania militia in Gettysburg. Fate – and the fighting – would wait until tomorrow. 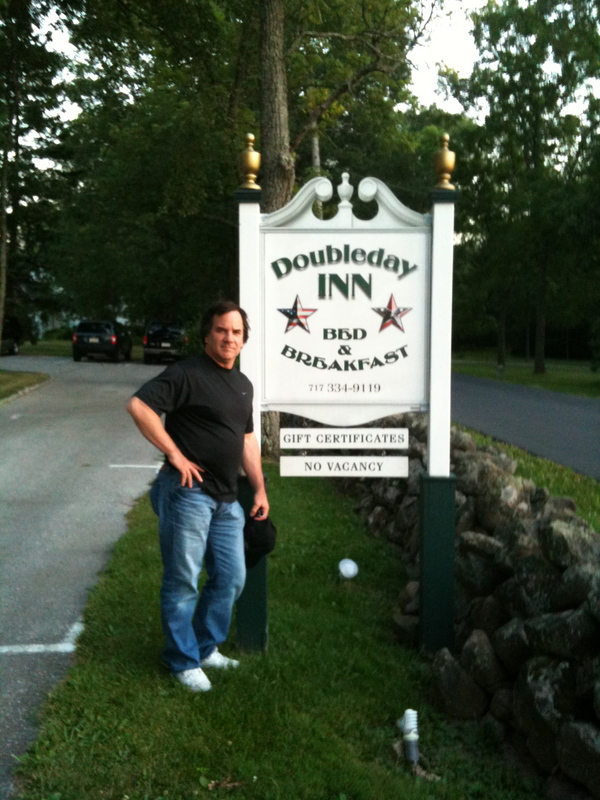 And so, as Victoria and I pulled into the parking lot of The Doubleday Inn, would our own adventures on the Gettysburg battlefield wait until the following day. The charming house at 104 Doubleday Avenue, now The Doubleday Inn, was built in 1939 and it’s the only B & B or hotel located on the grounds of the Gettysburg National Military Park. 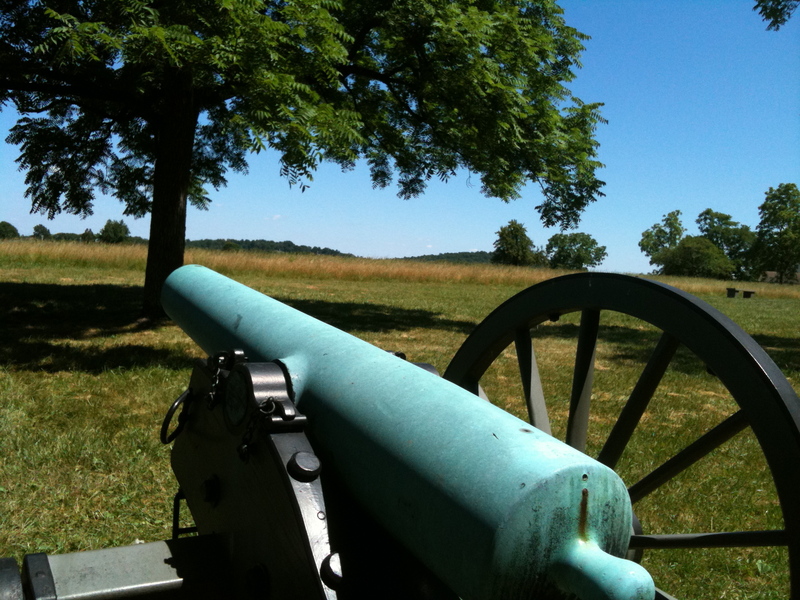 It stands on the very ground that Buford and his cavalry would defend the next morning. There are 42 battlefield monuments within a quarter mile of the Inn honoring the regiments that took part in the fierce fighting that took place here on July 1, 1863. Before we turned in for the night, we took a sunset stroll along Doubleday Avenue on Oak Ridge to check out the monuments lining the road in front of the Inn. Our favorite was the monument dedicated to the 11th Pennsylvania Volunteer Infantry. All of the monuments at Gettysburg are stirring, heartbreaking testaments to valor and sacrifice – but this one is unique because of a dog. On the side of the monument that faced the enemy that bloody day is a cast iron representation of the regiment’s beloved mascot, a terrier named “Sallie,” who was said to have hated three things: Rebels, Democrats, and Women. According to the well-documented story, after the first day’s battle was over, faithful Sallie refused to leave the field where her brave boys had fought and fell. She stayed with her dead soldiers until she was found, weakened and close to death, a day after the battle. Sallie’s regiment nursed her back to health and she fought with them until she was killed in battle in February 1865. Sallie’s boys never forgot their faithful canine comrade – immortalizing her on their regimental monument. July 1st – the first day of the Battle of Gettysburg. Hurry! I want to read more! wow! i can ‘t wait to read more…..
this is my kind of trip! vicksburg, ms is a great place to visit to for civil war history and they have several nice b an b’s in that town. fantastic. Love that part of the country & love old battlefields. They all carry so much weight – all the souls who lost their lives there remain. Did you see McCutcheon? Did he get you righteous Phillies seats? It looks as if your marriage is as strong and relevant as the Gettysburg Address. Superb! Hurry with the follow up as I want to see who wins. Where else to go but “Vic”ksburg??? Sounds like a fantastic time. Eager to read the continuing adventures. Hello! I enjoyed reading the travelogue of your visit to Gettysburg and was delighted to see Victoria’s photo with Sallie, the mascot of the 11th PA Volunteers. Would you and Victoria consider sharing the photo with my Web site, LoyaltyOfDogs.com? Many Gettysburg visitors have their photo taken with Sallie–sometimes entire families and even bus tour groups–as a special souvenir. I will be adding a “Visitors” page to my site, and would be grateful if you would allow your photo to be added. As you will see if you visit the site, Sallie’s story inspired me to publish a souvenir poster devoted to dogs of the Civil War, for the purpose of donating profits to support animal rescue. 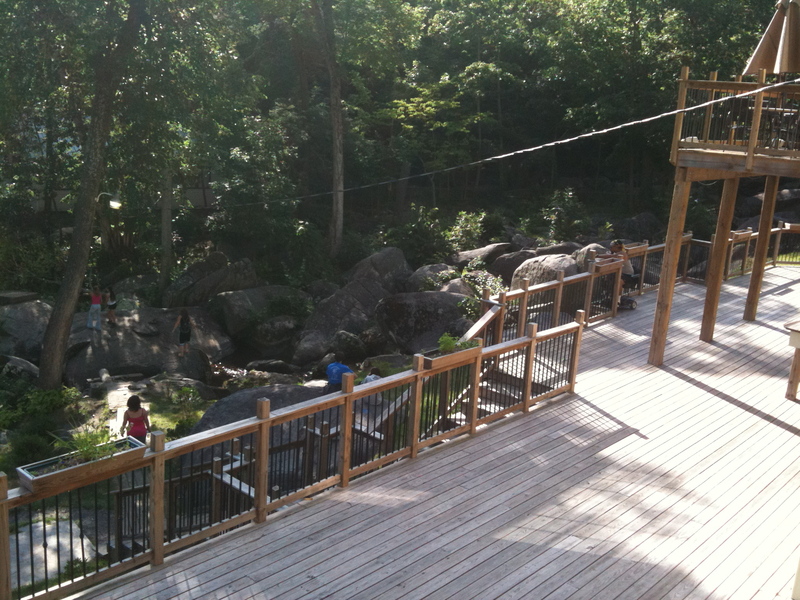 We had a great debut season last year and are looking forward to Gettysburg’s 2012 summer. Thank you for your consideration! You may certainly use the photo and re-print any of my blog article. On the day we were there, someone had left a dog biscuit for Sallie. It moved us both to tears. Hello, Paul. I am long overdue in thanking you and Victoria for your kind permission to use the photo from your visit with Sallie on our page. I often have the same reaction that you did when I see how lovingly Sallie has been remembered by those who stop by to see her. Thank you again for your kindness. You can view Victoria’s picture with Sallie in our gallery here: http:www.loyaltyofdogs.blogspot.com.